By the end of 2014 and 18 months since its launch, Paul’s incredible ‘Out There’ tour has been seen by almost two million people around the world. Paul and his band have performed a total of 64 shows in 12 different countries in venues of all different shapes and sizes. Each show on the tour has seen multi-generational audiences from all different kinds of backgrounds come together to share in the incredible magic of a McCartney live show. Last year for reasons beyond his control Paul was forced to cancel his first ever trip to South Korea. 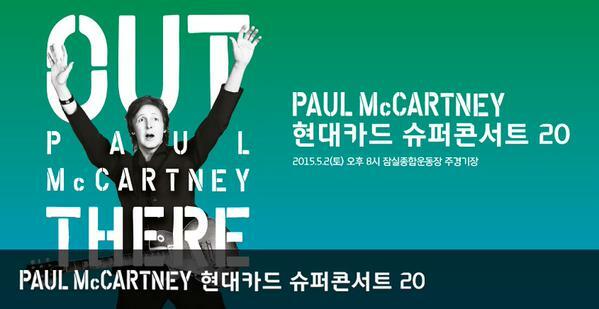 Today it is confirmed that Paul will bring his show to Seoul this May. 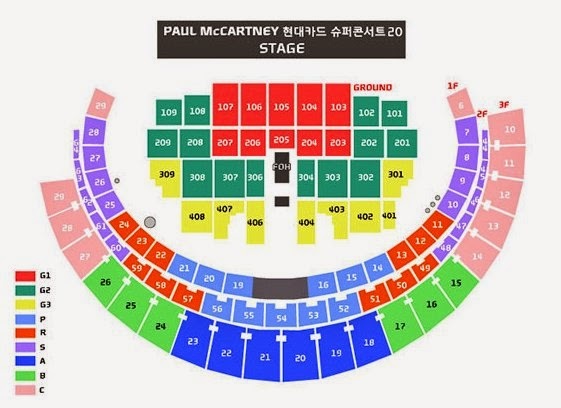 Paul was incredibly disappointed that he couldn’t play there last year and was determined that he would bring his show to South Korea, taking place at Olympic Stadium this May 2nd, 2015. Fans registered with PaulMcCartney.com will be eligible to purchase pre-sale tickets from 6pm (local time / 9am GMT) on Tuesday 10th February. Please note: To be elligible for this pre-sale fans must be registered by 4pm (local time / 7am GMT) on 10th February. The ‘Out There’ tour features music from one of the best loved catalogues in popular music. 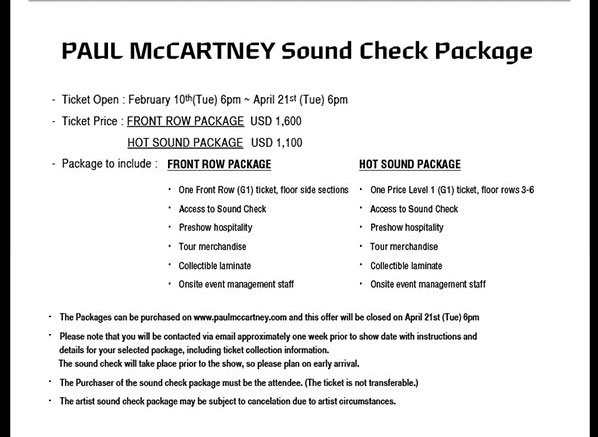 Paul will perform songs that span his entire career – as a solo artist, member of Wings and of course as a Beatle. The set list will also include material from Paul’s most recent studio album NEW, which was a global hit upon its release. The McCartney live experience is a once in a lifetime opportunity; in just three hours some of the greatest moments from the last 50 years of music are relived; music which for many has shaped the very soundtrack of their lives. The last decade has seen Paul and his band perform in a staggeringly impressive range of venues and locations, including outside the Coliseum in Rome, in Moscow’s Red Square, Buckingham Palace, at the White House, a free show in Mexico to over 400,000 people and even into Space! Having played with his band (Paul ‘Wix’ Wickens (keyboards), Brian Ray (bass guitar/guitar), Rusty Anderson (guitar) and Abe Laboriel Jr (drums)) for over ten years now, the show never disappoints. The tour also uses state of the art technology and production to ensure the entire audience has the best possible experience. With massive screens, lasers, fireworks, unique video content and the best songs in the world a Paul McCartney show is so much more than just an ordinary concert. Tickets will be available on YES24 (ticket.yes24.com, For English Booking,ticket.yes24.com/English), Interpark (ticket.interpark.com, For English Booking,ticket.interpark.com/global) and livenation.kr from February 12th (Thursday) at 12PM. 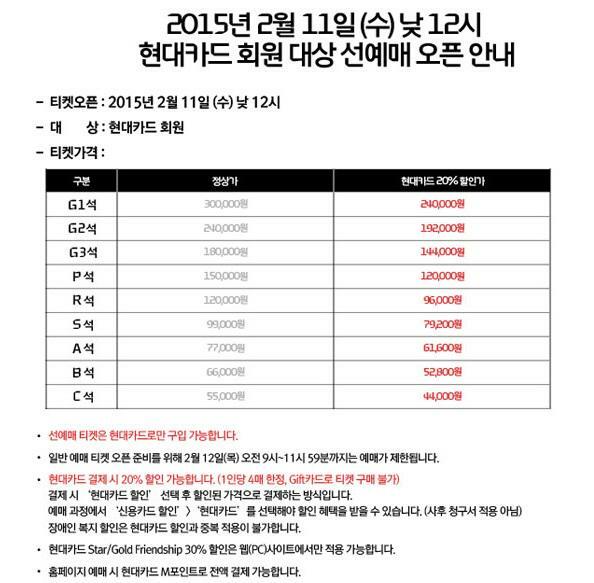 There will be an exclusive pre-sale open to Hyundai Card holders on February 11th (Wednesday) at 12PM. 폴 매카트니의 ‘Out There’ 투어는 2013년 브라질을 시작으로 18개월 동안 북미와 남미, 유럽 12개 나라의 각기 다른 공연장에서 펼쳐지며, 세대와 배경을 뛰어넘어 200만 명 (총 64회)에 달하는 관객들과 공연의 감동을 나눠왔다. 폴 매카트니는 지난 해 5월, 스무 번째 슈퍼콘서트를 통해 역사적인 첫 내한공연을 가질 예정이었으나, 갑작스러운 바이러스성 염증에 따른 건강 악화로 내한공연을 취소해 그의 공연을 기다린 수많은 팬들에게 아쉬움을 남겼다. 당시 폴 매카트니는 “첫 한국 방문과 공연을 기다렸는데 한국 팬들을 실망시켜 매우 죄송하다.”며 “빠른 시일 내 공연을 성사시키겠다.”는 메시지를 전해왔었다. 그리고 마침내 2015년 5월2일 잠실종합운동장 주경기장에서 그 약속이 성사되었다. 이번에 다시 내한공연 일정이 확정되면서 폴 매카트니의 첫 내한공연을 간절히 기다린 수많은 팬들의 소원도 이루어지게 됐다. 폴 매카트니 역시 “마침내 한국에서 공연을 하게 되어 매우 기쁘다. 지난해 한국 방문을 기대하고 있었으나 어쩔 수 없는 사정으로 공연을 연기하게 되어 몹시 아쉬웠고, 많은 한국 팬들이 보내준 따뜻한 메시지에 감동했다. 조만간 한국 팬들과 함께 할 멋진 밤을 기대하고 있다.”는 인사말과 함께 첫 내한공연에 대한 기대감을 전해왔다. ‘Out There’ 투어는 비틀즈와 윙스 시절의 히트곡부터 최신 앨범 [NEW] 수록 곡까지 다양한 곡들을 선보이며 폴 매카트니의 50년 음악 일대기를 한 곳에서 경험할 수 있는 국내 최초이자, 최고의 기회가 될 것으로 보인다. 이번 콘서트에는 폴 매카트니와 10년 이상 호흡을 맞춰온 폴 위킨스(Paul ‘Wix’ Wichens, 키보드), 브라이언 레이(Brian Ray, 베이스/기타), 러스티 앤더슨(Rusty Anderson, 기타) 그리고 에이브 라보리엘 주니어(Abe Laboriel Jr., 드럼) 등이 최고의 무대를 꾸민다. 또, 대형 스크린과 화려한 레이저, 폭죽, 비디오 컨텐츠 등 최첨단 기술과 대규모 프로덕션을 통해 폴 매카트니의 수많은 명곡들을 더욱 아름답고 웅장하게 선사할 예정이다. 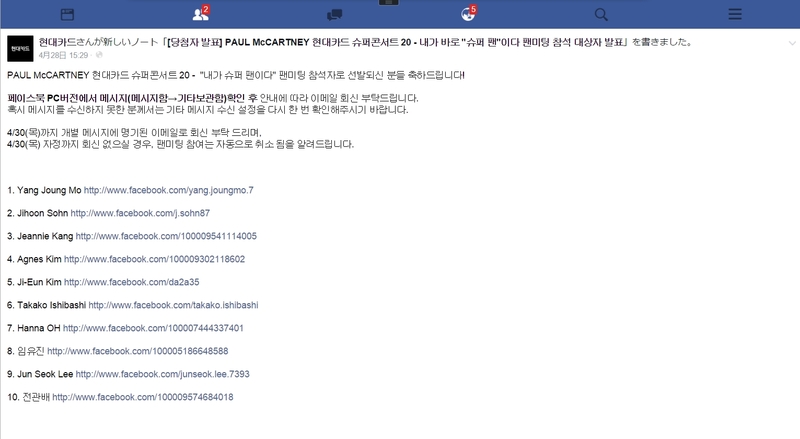 이번 공연의 아티스트 선예매 티켓은 PaulMcCartney.com에서 2월 10일 오후 6시부터 24시간동안 진행된다. 자세한 내용은 PaulMcCartney.com을 참고하면 된다. 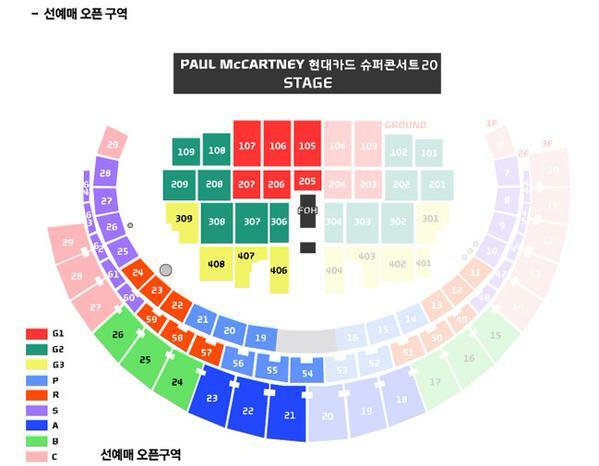 <폴 매카트니(Paul McCartney) 현대카드 슈퍼콘서트 20>의 티켓은 G1석이 300,000원, G2석이 240,000원이며, G3석은 180,000원이다. P석과 R석은 각각 150,000원과 120,000원이며 S석은 99,000원이다. A석과 B석 그리고 C석은 각각 77,000원, 66,000원, 55,000원이다. 모든 티켓은 현대카드 결제 시 20% 할인 혜택이 제공된다. (VAT 포함, 1인 4매 한정) 인터파크와 YES24 예매 시에는 현대카드 M포인트로도 티켓 값 결제가 가능하다. (M포인트 결제는 5천 M포인트 이상, 10 M포인트 단위로 결제 가능). 이번 현대카드 슈퍼콘서트 티켓은 2월 12일(목) 낮 12시부터 인터파크(ticket.interpark.com)와 YES24(ticket.yes24.com), 라이브네이션코리아 홈페이지(www.livenation.kr) 를 통해 판매되며, 현대카드 회원은 2월 11일(수) 낮 12시부터 사전 예매를 통해 티켓을 구매할 수 있다. ‘현대카드 슈퍼콘서트(Hyundai Card Super Concert)’는 2007년부터 시작된 대한민국을 대표하는 초대형 공연 프로젝트다. 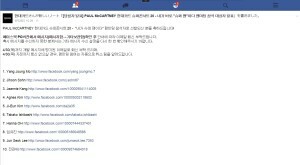 현대카드는 ‘스티비 원더’와 ‘마룬5’, ‘에미넴’, ‘레이디 가가’, ‘메탈리카’, ‘오지 오스본’ ‘비욘세’ 등 전 세계 최정상급 아티스트만을 엄선해 최고의 공연을 선보여왔다.